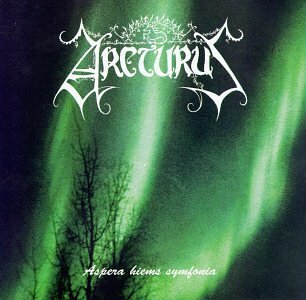 Excellent debute album from this already legendary band named Arcturus. Aspera hyems symphonia issued in 1996 is to me at least if not for many one of the most inventive symphonic black metal album ever with clearly many progressive touches in his 42 min lengh. Formed by well known names in this field , but specially Carl August Tidemann from Winds fame, who is a fenomenal guitarsit, his mark on this album is top notch. Quite complex and yet in same time melodic black metal album, this has nothing to do with the raw black of Immortal or early stuff, Aspera hyems is full of intelligent passgaes where the melodic side of black metal almost progressive metal in places because of the guitar and sound overall is melted with the voice who is raw and in black metal type because the instrumenets even are well performed by each member in some parts the sound is little precare and amatorish. Anyway I love this album, I have it since it was released more then 15 years ago, what a treat for my ears was then as now, still very fresh in ideas and one hell of a great ride for me. Like a lot the guitar who is very avangarde and goes progressive metal most of the time nice solos by Tidemann aswell, the use of keyboards is great and gives a perfect symphonic atmosphere. For me easy 4 stars a fine album all the way. No weak tracks for sure, all are winners.